Woldenberg Park | Experience New Orleans! 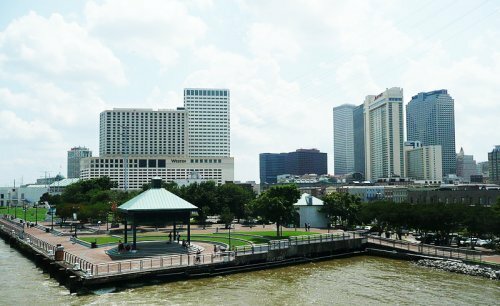 Nestled at the base of Canal St along the Mississippi Riverfront, Woldenberg Park is an area of picturesque greenspace that offers downtown and French Quarter passersbys a front-row view of the river and ample areas for picnics, events, and sight-seeing. The park’s 16 acres are a hotspot for everything from festivals to popular pathways for joggers and bikers, and Woldenberg Park is filled with sculptures and artwork to complement the riverfront view. On the site of what is now Woldenberg Park, floodwalls, warehouses, and industrial docks once ran along the Mississippi River. The area was transformed into a public park complete with lush greenery, bricked walkways, and public art, and it opened to the public before the 1984 World’s Fair, which the city hosted that year. The park was named for philanthropist Malcolm Woldenberg, who contributed to the park’s creation. The area now attracts around 7 million visitors each year, according to the Audubon Institute, which oversees it. Woldenberg Park begins at Canal Street and the Audubon Aquarium of the Americas and is situated between the Mississippi River and the streets of the French Quarter. 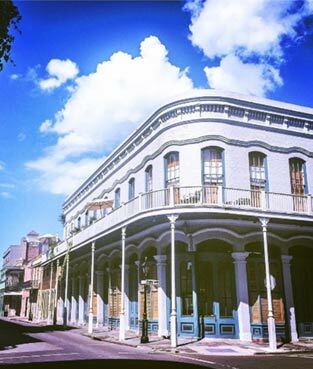 It stretches down the river past Jackson Square and the New Orleans Jazz National Historical Park to around St. Philip St. Along the river is the Moonwalk, a paved riverside jogging path named for former New Orleans mayor Maurice “Moon” Landrieu, where bikers, joggers, and anyone looking to stroll the length of the river can find a path with a winning view of the Mississippi. Spectators enjoy grabbing a seat on the benches, grass, or rocks nearby and watching tug boats, tankers, freighters, cruise ships, and long barges passing through the busy river destined for various ports, refineries, and terminals along the way. The park’s collection of sculptures and other artwork inject culture and beauty into the greenspace, including a bronze statue of Malcolm Woldenberg and a polished stainless steel sculpture called “Ocean Song” created by a local artist to symbolize the motion of water. Further down, visitors can find “Monument to the Immigrant,” “Old Man River,” and the city’s Holocaust Memorial, dedicated in 2003. Outside of the aquarium and Entergy Imax Theatre are also a number of sculptures depicting marine life. In 2015, Woldenberg Park activated a new 90-foot linear water fountain in front of the aquarium, which is the perfect place for kids to run around and cool off on a hot summer day in New Orleans. The fountain is open during the aquarium’s business hours, depending on the weather, and it is enhanced by 30 varying light shows when events on the plaza stretch into the evening hours. Woldenberg Park hosts a number of festivals and events throughout the year. 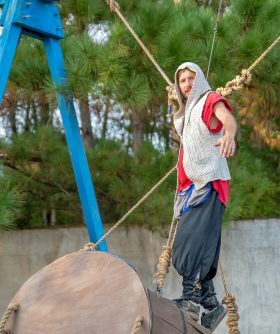 The park is most notably home to the main stages for French Quarter Fest, held each April, but other smaller festivals like the New Orleans Oyster Festival also call Woldenberg Park home. The magnificent view of the river from Woldenberg Park also makes it a top destination for watching fireworks over the Mississippi, which are set off for both New Year’s Eve and the Go Fourth on the River celebration for Fourth of July. For a unique way to enjoy the beauty of New Orleans, visit Woldenberg Park, a free destination with an unforgettable view and space to take a break from the bustle of New Orleans’ city life.